Death was ever present in the minds of people of the eighteenth century, and the dangers of the sea made it especially so among seamen. Much has been written on eighteenth-century funerary practices afloat and ashore. Burial at sea has featured prominently in mass media. 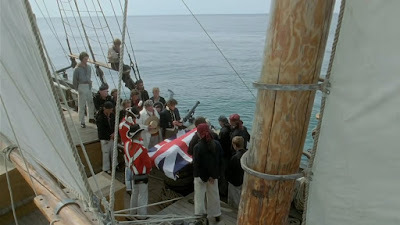 As soon as someone on the ship dies, whether he is a soldier, sailor, or anyone else, he is fastened onto a piece of wood or a board and then a sack filled with sand or a stone, or a piece of iron, or a cannonball, is fastened on the piece of wood or board so that the dead body, which later will become food for the fish, is immediately pulled under the water. Sunday, 27th. Wind at N. V. at 4 AM Tack'd ship. At same time the man who was bade with the flux was found dead in his hammock, at 8 he was sewed up in it and at 9 AM he was burried in the sea after reading the service of the Dead over him, which was done by the Mate. And with looks by sorrow clouded Frowning on that hostile shore. We conceal the death of the sailours from the negroes by throwing them overboard in the night, lest it might give them a temptation to rise upon us. The opposite was true on Olaudah Equiano's Middle Passage. As a young man, he witnessed the crew beat a sailor to death before 'they tossed him over the side as they would have done a brute.' This was a different kind of deterent, because it 'made me fear these people the more; and I expected nothing less than to be treated in the same manner.' Robert Barker, a shipwright on a slaver, uses the term 'thrown overboard' to describe the method by which the bodies of slave ship sailors were disposed of. He implies a distasteful treatment of the dead on the slave trade. The shrill-blown pipe convenes the remnant crew. And rise to join the melancholy rite. That, Ruffel parting, opes thy fluid grave! Plung'd in the abyss, he finds the liquid tomb! More ceremony could be expected in the Royal Navy and aboard merchantmen. 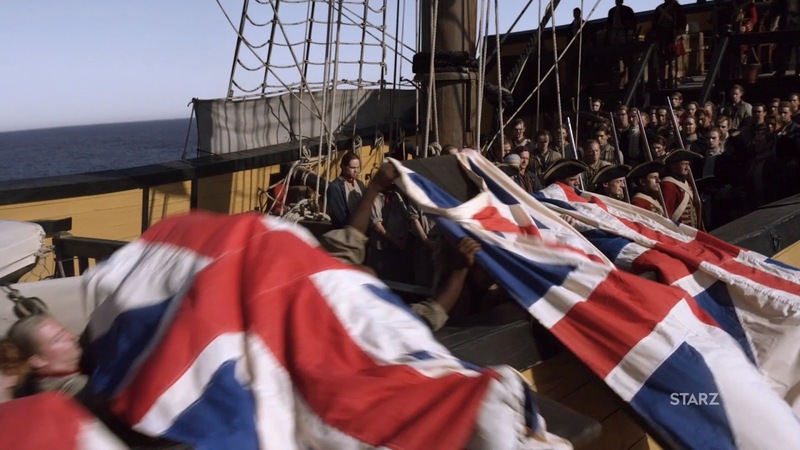 Aboard British warships, only the Anglican Book of Common Prayer was used in burials at sea. Below is an excerpt from the 1762 edition of that religious text, giving the precise language to be used when committing a body to the deep. We therefore commit his Body to the Deep, to be turned into Corruption, looking for the resurrection of the Body (when the Sea shall give up her dead,) and the life of the world to come, through our Lord Jesus Christ; who at his coming shall change our vile Body, that it may be like his glorious Body, according to the mighty working, whereby he is able to subdue all things to himself. At first, burial at sea might have been distinctly British. Connell and Mack state 'In the seventeenth and early eighteenth centuries French men-of-war sometimes carried the remains of those who died at sea in the holds until the ships reached port. Old reports indicate that this was a very disagreeable practice and one that served solely the purpose of burying the deceased in consecrated soil.' 'French and Spanish Roman Catholic mariners,' writes Berry,' usually transported the deceased in the hold of the ship so that they could be interred in consecrated ground.' He suggests that part of the reason for burial at sea may have been sailors fear of their shipmates 'body haunting the ship.' On the other side of the coin, Earle states that 'most sailors had a superstitious aversion' to burial at sea for themselves. I'm inclined to disagree with both of these historians, as neither provides strong evidence for sailors' feelings toward burial at sea, and sailors' superstitions are often overplayed. But then, neither claims superstition as the sole reason for this aversion to burial at sea. Their Voracity refuses nothing; Canvas, Ropeyarns, Bones, Blanketing, &c. I have seen them frequently seize a corpse as soon as it was committed to the sea; tearing and devouring that, and the Hammock that shrouded it, without suffering it once to sink, tho' a great Weight of Ballast in it. The river Bonny abounds with sharks of a very large size, which are often seen in almost incredible numbers about the slave ships, devouring with great dispatch the dead bodies of the negroes as they are thrown overboard. The bodies of the sailors who die there, are buried on a sandy point, called Bonny Point, which lies about a quarter of a mile from the town. Perhaps this was the captain splitting the difference between frightening the enslaved with the callous disposal of the dead as mentioned by Equiano, and preventing the enslaved from knowing how their enslavers were being weakend as the sailor of the Florida attested to. It happens before one's eyes that, as soon as the dead body is thrown into the water, the fish or other creatures gather and tear him apart and consume him, and there are crabs that are so large that they can hold a man in their pincers and pull him under the water. These are called lobsters and are twelve feet long and as large around as a man's body, and one claw weighs over twenty pounds. I myself have seen an English soldier thrown into the water who was grabbed by a crab with his claws and pulled under the water. The briny monsters seize with savage force. Rank alligators seize the quiv'ring prey. The last avenger of th' insulted shore! I commend my Soul into the hands of Almighty God hoping for Remission of all my Sins thro the Merits of Jesus Christ my blessed Saviour and Redeemer and my Body to the Earth or Sea as it shall please God. When I came to our Ship, I found one of our Midshipmen (whose Name I have forgot) was drowned in Catwater, in endeavouring to swim ashore. He was buried very decently in the new Churchyard, in Plymouth; and those of our Men that made the best Appearance, and which we were sure would not run away, attended at the Funeral. Every one had a Pair of Pistols stuck in his Belt, a Hanger by his Side, and there were Swords cross'd on the Coffin Lid. I was placed under a sand bank, and there was a number of people over me throwing down sand that often covered me. I then struggled until I got my head above the sand and breathed. But they continued shoveling it upon me until I thought it would be impossible to get my head out and fetch my breath. And the last struggle I made, I was sure it would be the last, for my strength was nearly gone. When the diggers realized that Prince was still alive, they abandoned him on the beach, presumably still half buried. ADM 36/6179, Nightingale Muster Book, 1754 Oct - 1756 Jun, photo by Alexa Price. As Gilje states, 'this sale also became an effective way to distribute used goods among the crew. It also connected the sailor at sea to his family on land.' Among sailors themselves, the chest and their late shipmate's possessions could also serve as a sentimental reminder. He was a native of America, had received an excellent education, and was of a most amiable temper. Soon after I went on board he shewed me a great deal of partiality and attention, and in return I grew extremely fond of him. We at length became inseparable; and, for the space of two years, he was of very great use to me, and was my constant companion and instructor. Although this dear youth had many slaves of his own, yet he and I have gone through many sufferings together on shipboard; and we have many nights lain in each other's bosoms when we were in great distress. I ran to enquire about my friend; but, with inexpressible sorrow, I learned from the boat's crew that the dear youth was dead! and that they had brought his chest, and all his other things to my master: these he afterwards gave to me, and I regarded them as a memorial of my friend, whom I loved and grieved for as a brother. Hardened men though they were, sailors mourned one another. Funeral rites could help them cope with their loss. Connell, Cdr. Royal W. and Vice Adm. William P. Mack, Naval Ceremonies, Customs, and Traditions, sixth edition, Annapolis: Naval Institute Press, 2004, page 70. Döhla, Johann Conrad, A Hessian Diary of the American Revolution, edited by Bruce E. Burgoyne, Norman, OK: University of Oklahoma Press: 1993, page 20. Connell and Mack, Naval Ceremonies, 71. Rediker, Marcus, The Slave Ship: A Human History, New York: Viking, 2007, page 38. "Diary of John Harrower, 1773-1776," The American Historical Review, Volume 6, Number 1, October 1900, page 73, via Internet Archive, accessed August 1, 2018, <https://archive.org/details/jstor-1834690>. Glover, Richard, "Admiral Hosier's Ghost," via Barlteby.com, accessed August 1, 2018, <https://www.bartleby.com/333/81.html>. Thunberg, Carl Peter, Travels in Europe, Africa, and Asia, made between the years 1770 and 1779, Third Edition, London: F. and C. Rivington, 1796, page 118, Yale University via the HathiTrust Digital Library, accessed August 1, 2018, <https://catalog.hathitrust.org/Record/008726012>. Rediker, Slave Ship, page 246; Earle, Peter, Sailors: English Merchant Seamen 1650-1775, London: Methuen, 2007, page 140. Barker, Robert, The Unfortunate Shipwright: Or Cruel Captain, London: Robert Barker, n.d., c1760., page 23. Stanfield, James Field, The Guinea Voyage: A Poem, London: James Phillips, 1789, pages 23-24. The Book of Common Prayer, 1762, via Google Books, accessed August 2, 2018, <https://books.google.com/books?id=WgsVAAAAQAAJ&dq=book+of+common+prayer&source=gbs_navlinks_s>. Berry, Stephen R., A Path in the Mighty Waters: Shipboard Life & Atlantic Crossings to the New World, New Haven: Yale University Press, 2015, page 66. Connell and Mack, Naval Ceremonies, 69. Follower Adam Hodges-LeClaire points out that this may not have been the case by the mid to late eighteenth century. Boudriot, Jean, (trans., Robert, David H.), The Seventy-Four Gun Ship: A Practical Treatise on the Art of Naval Architecture, Volume IV, Manning & Shiphandling, Annapolis: Naval Institute Press, 1986, pages 155-157. This work is also without notes and citations, though the author suggests the Naval Ordinance of 1765 includes a detailed approach to burial at sea in the French Navy. I have not yet found the Ordinance and so cannot verify one way or the other. Berry, Path in the Mighty Waters, page 124. Atkins, John, A Voyage to Guinea, Brasil, and the West-Indies, Scarborough: Ward and Chandler, 1737, page 46, via Google Books, accessed August 1, 2018, <https://books.google.com/books?id=xak-AQAAMAAJ&source=gbs_navlinks_s>. Falconbridge, Alexander, An Account of the Slave Trade on the Coast of Africa, Second Edition, London: James Phillips, 1788, page 67, via Google Books, accessed August 1, 2018, <https://books.google.com/books?id=_lTrja-FFXEC&dq=account+of+the+slave+trade+on+the+coast+of+africa&source=gbs_navlinks_s>. Döhla, A Hessian Diary, page 20. Stanfield, Guinea Voyage, page 23. "Will of Jonathan Hill, Mariner now belonging to His Majesty's Ship Trident of Gosport," National Archives (UK), 11 March 1756, PROB 11/821/151. Wyatt, James, The Life and Surprizing Adventures of James Wyatt, London: W. Reave, 1753, page 12. Prince, Christopher, The Autobiography of a Yankee Mariner: Christopher Prince and the American Revolution, edited by Michael J. Crawford, Washington, D.C.: Brassey's Inc., 2002, pages 95-96. Gilje, Paul A., To Swear Like a Sailor: Maritime Culture in America, 1750-1850, New York: Cambridge University, 2016, page 266. Equiano, Interesting Narrative and Other Writings, page 79. Wonderful and well researched article, thank you!